Thousands of outraged Palestinians took to the streets of the West Bank on Thursday, joining funeral processions and demonstrations after two protesters were killed by Israeli troops and a Palestinian prisoner died of cancer in Israeli custody. Palestinian President Mahmoud Abbas said Israel was responsible for the violence, claiming it was trying to divert attention from a four-year standstill in peace efforts. Tensions rose further Wednesday when two Palestinian youths were killed in the northern West Bank after throwing firebombs toward Israeli troops. In an apparent show of solidarity with Abu Hamdiyeh, militants in the Gaza Strip fired rockets into Israel for three straight days, drawing Israeli retaliation, in the greatest challenge yet to a cease-fire reached in November. So the “peaceful young protesters” carrying out their “peaceful demonstrations” on behalf of “stability and calm” were hurling firebombs at Israeli troops. How peaceful can you get? 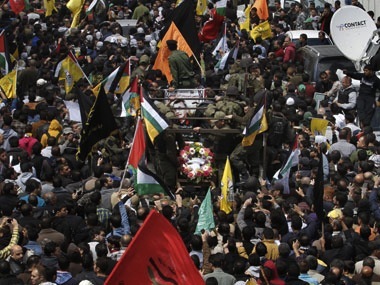 Mourners carried Abu Hamdiyeh’s body through the streets of the town, while chanting anti-Israel slogans and burning U.S. flags. 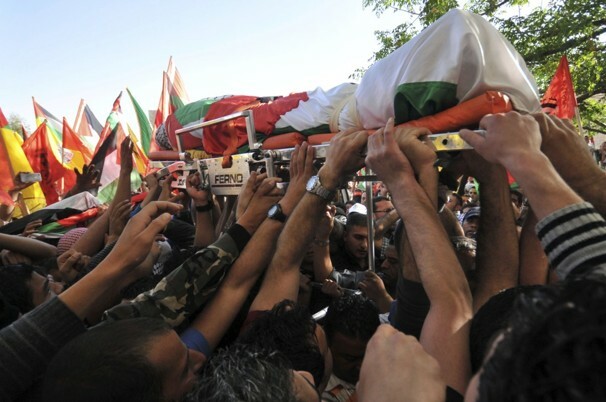 Masked gunmen fired into the air, while Abu Hamdiyeh was given a full military burial. The AP tells us that “[t]he Palestinians have blamed Israel for not giving him proper treatment.” Is there any evidence for that claim? None cited by the AP, certainly, and Israel is famous for providing first-class medical treatment to Palestinians, including Palestinians caught in acts of terrorism. And who was Maysara Abu Hamdiyeh, anyway? Abu Hamdiyeh had been serving a life sentence for involvement in an attempt to carry out a suicide bombing in a crowded Jerusalem restaurant a decade ago. The issue of Palestinian prisoners is deeply emotional in Palestinian society. Nearly every Palestinian family has a member or close acquaintance who has spent time in an Israeli prison…. You might think that fact reflects very poorly on the Palestinians, but no! 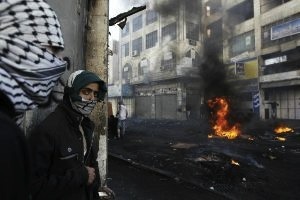 The AP thinks it is an indictment of Israel. All of this makes my head hurt. It is Groundhog Day X 100: we have seen the same fatuous reporting on the same dance of death more times than any of us can remember. Some months ago, I wrote that Israel should give up on the Palestinians and annex the West Bank. The West Bank has no rightful owner under international law, and no one has a better claim to Judea and Samaria than Israel. A half million Israelis now live on the West Bank, and others, including Caroline Glick, have since joined the call for annexation. Recently some Israelis floated a proposal to pay Palestinian families a substantial amount of money to vacate Judea and Samaria and go somewhere else, like Gaza, or Jordan or Syria or Egypt, or Europe, where they are ostensibly so popular. These are all good ideas, in my view. And they would allow us to wake up from Groundhog Day to the prospect of real change in a small but long-troubled corner of the world.